Jay Holdcroft – bit of trickery almost unlocked the home defence in a rare moment of danger. Khalsa endured a torrid time at league leaders Ilkeston as the dominant home side took a giant step towards the title with a scintillating first-half performance. Ilkeston were three goals to the good thanks to a devastating 19 minute first half spell which left Khalsa on the ropes. And although the visitors were much improved in the second half, Ilkeston stayed solid as a rock and could easily have extended their lead. From the off, it was an uptempo affair with Khalsa having early half-chances with Ilkeston’s backline blocking off efforts from Josh Thomas and Dan Westwood. 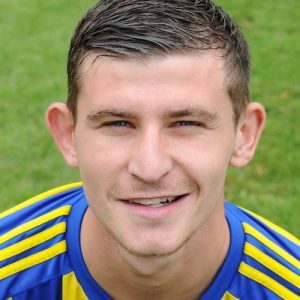 On 15 minutes Ilkeston fired their first warning shot, Alex Marshall should really have done better with a very tempting Billy Bennett cross from the left. But Town didn’t have to wait long for the opener, Elliott Reeves finishing in some style after some excellent link-up play down the right. Khalsa almost grabbed an equaliser straight away, a Thomas corner from the right flashed across goal with Leon Miles just unable to make the decisive touch. Marshall should have doubled the lead on the half hour after capitalising on some hesitancy from Carlo Franco to get through, Sam Arnold making a save he knew very little about to deny the striker. On 39 minutes it was two, Bennett – brilliant all afternoon for the hosts – fired a clever low free kick through the crowd and past Arnold into the net. And seconds later Reeves grabbed his second to effectively end the contest, poking home to wild celebrations as the bumper home crowd sensed a season-defining moment. Town almost made it four just after the restart, a combination of Arnold and Tes Robinson clearing off the line from Marshall’s header. Khalsa began to build up a bit of momentum as the formation shifted towards offence, but really nothing looked like threatening Liam Mitchell’s clean sheet.Substitute Jay Holdcroft sent a tantalising ball across the goalmouth which eluded both Robinson and Westwood on the hour for what was probably the best opportunity. On 73 minutes Westwood headed well over from Liam Armstrong‘s cross and four minutes later there was a real lack of conviction in the striker’s shot as he picked up the ball and turned just inside the area. Holdcroft was denied by a defender on 85 minutes and with the game entering stoppage time Dave Meese headed over. With seconds to go, Town substitute Kyle Dixon burst through on the break for what would have been a champagne close to a celebratory afternoon for the home side, only to fluff his lines in the one-on-one with Arnold and end up putting wide. But it mattered little as the final whistle saw Ilkeston put one hand on the Midland Football League trophy. Sporting Khalsa: Sam Arnold, Carlo Franco (Shawn Boothe), Sean Williams, Leon Miles, Tes Robinson (captain), Dave Meese, Mensah Kinch, Rico Taylor (Jay Holdcroft), Dan Westwood, Liam Armstrong, Josh Thomas. Subs not used: Alex Perry, Mykel Beckley, Remi Birch.